relationships enable you to define how nodes relate to one another. For example, a web_server node can be contained_in a vm node or an application node can be connected_to a database node. type yes string Either a newly-declared relationship type or one of the relationship types provided by default when importing the types.yaml file. target yes string The name of the node to which the current node is related. source_interfaces no dict A dictionary of interfaces. target_interfaces no dict A dictionary of interfaces. By default, nodes can be related using the relationship types described below. You may also declare your own relationship types. Describes a node that depends on another node. For example, the creation of a new subnet depends on the creation of a new network. The cloudify.relationships.depends_on relationship type is for use as a logical representation of dependencies between nodes. You should only use it in very specific cases when the other two relationship types are not relevant, or when you want to specify that a certain node should be created before or after another for the sake of ordering. The other two relationship types inherit from the cloudify.relationships.depends_on relationship type. The semantics of the cloudify.relationships.connected_to relationship type is the same. Therefore, usage reference should be dictated by cloudify.relationships.connected_to which is described below. A node is contained in another node. For example, a Web server is contained within a VM. The vm’s node instances are created before the http_web_server’s node instances. Two instances of the http_web_server node will be created within each of the two node instances of the vm node. This means that there will be 4 node instances of the http_web_server node. The number of node instances for each node that is contained within another node is determined by multiplying the number of instances requested for the contained node and the actual number of instances of the node it is contained in. Node ‘A’ is set to have ‘X’ node instances. Node ‘B’ is set to have ‘Y’ node instances. Node B is cloudify.relationships.contained_in node A. Then, node ‘A’ will have X node instances and node ‘B’ will have X*Y node instances - Y node instances per node instance in ‘A’. You may only use one cloudify.relationships.contained_in relationship per node. Note that the implementation of cloudify.relationships.contained_in does not necessarily dictate that a node must be physically contained in another node. For instance, a counter-example to the http_web_server in a vm is an ip node that is contained in a network node. Although the IP isn’t actually contained within the network itself, if two instances of the ip node have the cloudify.relationships.contained_in relationship type with the network node, there will be two ip node instances in each instance of the network node. A node is connected to another node. For example, an application is connected to a database and both of them are contained in a VM. 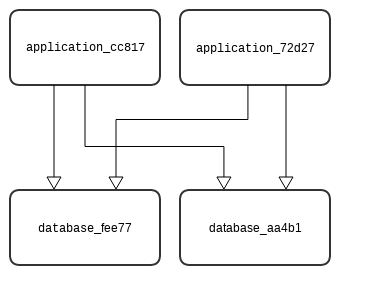 Since there are two vm node instances, two application node instances and one database node instance deployed, each of the VM’s will contain one database node instance and two application node instances, as explained in the cloudify.relationships.contained_in relationship type. This actually means that there are four application node instances (two on each VM node instance) and two database node instances (one on each VM node instance). All application node instances are connected to each of the two databases residing on the two VM’s. A specific feature in cloudify.relationships.connected_to allows you to connect a node to an arbitrary instance of another node. 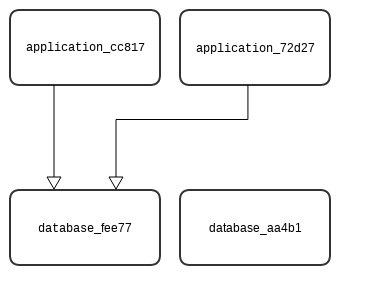 In the above example there two application node instances that arbitrarily connect to one of the two database node instances. The default configuration for connection_type is all_to_all. The same connection_type configuration can be applied to a cloudify.relationships.contained_in relationship type, although it has virtually no effect. As mentioned previously, the relationship types cloudify.relationships.connected_to and cloudify.relationships.depends_on and those that derive from it have a property named connection_type for which the value can be either all_to_all or all_to_one (The default value is all_to_all). The following diagrams make their semantics clearer. When deployed, there are two node instances of the application node and two node instances of the database node. All application node instances are connected to all database node instances. This would have relevance in the case of two Node.js application servers that must connect to two memcached nodes, for example. When deployed, there are two node instances of the application node and two node instances of the database node. All application node instances are connected to one database node instance (selected at random). This would have relevance in the case of two Node.js application servers that must add themselves as users on a single cassandra node, for example. In the case in which you have a node with two instances and two relationships configured for them, when a deployment is created, the node instances are instantiated in the model. In the same way that node instances are instantiated for each node, relationship instances are instantiated for each relationship. You can declare your own relationship types in the relationships section in the blueprint. This is useful when you want to change the default implementation of how nodes interact. derived_from no string The relationship type from which the new relationship is derived. In the above example, a relationship type called app_connected_to_db is created that inherits from the base cloudify.relationships.connected_to relationship type and implements a specific configuration (by running scripts/configure_my_connection.py) for the type. Each relationship type (and instance) has source_interfaces and target_interfaces. source_interfaces defines interfaces of operations that are executed on the node in which the relationship is declared. target_interfaces defines interfaces of operations that are executed on the node that its relationship targets. Defining interfaces source_interfaces and target_interfaces does not necessarily mean that their operations will be executed. That is, operations defined in cloudify.interfaces.relationship_lifecycle will be executed when running install/uninstall workflows. You can also add a custom relationship interface and write a custom workflow to execute operations from the new interface. Declaring relationships affects the node creation/teardown flow in respect to the install/uninstall workflows respectively. When declaring a relationship and using the built in install workflow, the first lifecycle operation of the source node is executed after the entire set of lifecycle operations of the target node are executed and completed. When using the uninstall workflow, the opposite is true. For instance, in the example, all source operations (node_instance operations, source_interfaces relationships operations and target_interfaces relationship operations) for source_node are executed after all target_node operations are completed. This removes any uncertainties about whether a node is ready to have another node connect to it or be contained in it, due to it not being available. Of course, it’s up to you to define what “ready” means. For building your application’s blueprints in a layered architecture, building blocks approach, the ability to wire in different component’s relationships is very useful and allows good separation of your application to self dependent blocks. Which can allow creating a complex inter-service relationships and full application view. The ip of the server the application will be deployed on. User name used when SSH-ing into the started machine. Path to a private key that resides on the management machine. SSH-ing into agent machines will be done with this key. The HTTP web server port. For more information about service composition please check out in depth look.